One of the most popular holiday gifts for little girls is a ballerina jewelry music box. 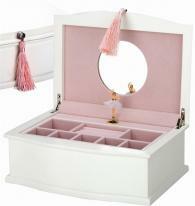 We recommend making your selection early if ballerina jewelry boxes are on your holiday gift list! 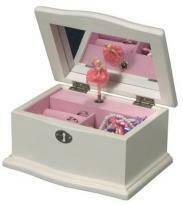 There are many styles of ballerina jewelry boxes to choose from. Depending on the age and intended use of the gift, you will be delighted with the selection available. In our store we have categories dedicated to the different types of ballerina boxes. Below is a breakdown and quick links to hopefully make your quest for the perfect ballerina box a little easier! Wood Ballerina Jewelry Boxes: A wooden ballerina jewelry box is a gift often handed down. They are favorite keepsake gifts that often stay in a family for generations. This selection features wooden designs crafted from hard wood. 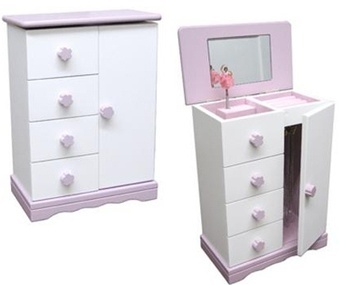 Our most popular ballerina jewelry boxes can be found in this category. Wood boxes with Illustrated Laminated Laser Paper Overlay: This selection of ballerina music boxes have lovely illustrated designed on laminated laser paper that overlay wood boxes. They feature quality construction without the price tag of a painted solid wood box and offer more detailed whimsical ballet designs. Plastic Toy Ballerina Boxes: These styles are made from durable white plastic with illustrated laser paper designs bonded to the boxes. This selection is intended for play and is perfect for little girls 3+. For the ultimate in keepsake heirloom ballerina jewelry boxes, consider this beautifully crafted wooden ballerina jewelry box. Made of American hardwood and featuring a dainty dancing ballerina that twirls to the Nutcracker Suite, this ballerina jewelry box provides generous jewelry storage and is crafted with old world charm. The lid features ten necklace hooks with sewn pouch to secure necklaces when lid is closed. Sliding panels feature two ring bars and two 3.75" x 3" compartments for bracelets or hair barrettes. Well beneath offers more generalized storage for additional jewelry and other treasures. The drawer features eighteen 1.5" x 1.5" squares for earrings. It's a jewelry box she can use now and as her jewelry collection grows, to enjoy now and forever. It's so well made that she will pass it along to her daughter someday. Big Sister, Little Sister. 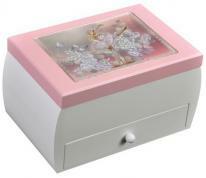 Two new styles are matching pink and white ballerina boxes that play "Dance of the Sugar Plum Fairy". These two ballerina boxes are perfect to give as a set or make wonderful big sister, little sister gifts. Click on the titles to view all the details. You will find two distinct designs as you shop - ballerina music boxes and ballerina jewelry boxes. Ballerina Music Boxes are designed primarily as Music Boxes - with room for a little jewelry. 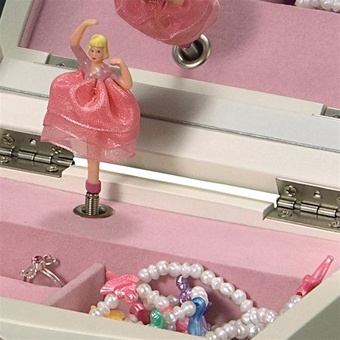 Ballerina Jewelry Boxes are designed primarily for jewelry storage - with a dancing ballerina. It's an important distinction to consider when making your selection. If it's a music box you're looking for consider the smaller styles. If jewelry storage is important, you may like the favorite design of a jewelry armoire that features hanging necklace storage. 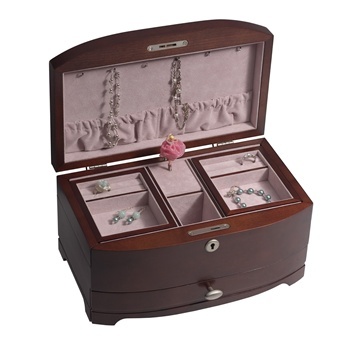 Or, consider one of the two Best Selling jewelry boxes shown above (one features jewelry drawers and the other a lift out tray) while both provide lots of room for little jewels!